Ambassador Rupert Schlegelmilch took up his duties as Permanent Representative of the European Union to the OECD on 19 October 2016. Mr. Schlegelmilch was born in 1957, he studied law and political science in Freiburg im Breisgau and in Berlin. Mr. Schlegelmilch joined the German Foreign Service in 1987 where he worked on international environmental issues and Cultural Diplomacy. He joined the European Commission Directorate General for External Relations in 1993. 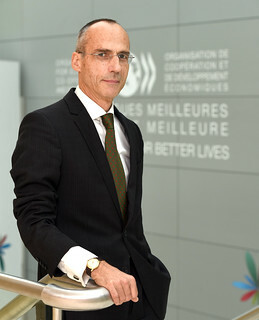 From 1998 to 2003 he worked on WTO matters in the European Commission in Geneva, followed by extensive work in Brussels on Trade and Sustainable Development and relations with Civil Society. From 2002 to 2006, Mr. Schlegelmilch was responsible for the EU’s bilateral trade relations with China, and later for the trade relations with the Americas and South Asia, Korea and ASEAN. From 2011 until his appointment as Permanent Representative of the European Union to the OECD, he was the Director for Trade in Services, Investment, Government Procurement and the protection of Intellectual Property Rights (IPR). He has been the EU's Chief negotiator for the EU-Singapore, the EU-Ukraine Free Trade Agreement (FTA) and the ongoing EU Mercosur Free Trade Agreement.